Where does Dr. DeSimone perform surgery? Dr. DeSimone performs outpatient procedures at the Weston Outpatient Surgical Center (WOSC). He is also on staff at Memorial West Hospital and Westside Regional Hospital. How soon is the first available appointment for surgery with Dr. DeSimone? Although Dr. DeSimone’s schedule is usually full 3-4 weeks in advance, he will accept emergencies and at times add additional surgical dates to his schedule. We also have a cancelation list that will often allow you to proceed with surgery at an earlier date. Will I be under general anesthesia or local? Most procedures are performed under general anesthesia, provided by a qualified anesthesia team. This depends on what kind of work you do and what procedure you are having. In general, we advise our patients to take at least 5-7 days off of work and/or school after surgery. This will allow for adequate rest, prevention of swelling, and pain control. Working/studying from home can often be initiated 2-3 days after the procedure. Patients are not allowed to drive themselves home from the surgery center, and should not drive the next day for the office visit. Once a patient is well rested/strong enough, and not taking narcotic pain medications during the day, then driving may be considered. When the procedure is on the right lower extremity, the patient may require additional recovery time before driving. Does Dr. DeSimone perform surgery on patients that are from out of town? It would be a pleasure to treat you. We generally ask that patients stay in town for a few days after surgery or until the sutures are removed. You will be provided a physical therapy (PT) prescription, as you are advised to seek out a PT facility upon your return home. Dr. DeSimone or his Physician Assistants will be available to speak with any provider that you may see in follow-up regarding your postoperative treatment. 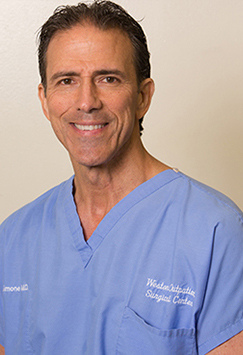 We always encourage a follow-up visit with Dr. DeSimone when/ if you return to south Florida. Is Physical Therapy necessary after surgery? Physical therapy is a vital component of your postoperative recovery. We will help you coordinate your appointment. We will verify your insurance, as it will be a privilege to treat you with our excellent physical therapists at one of our three different office locations (Weston, Plantation, and Silver Lakes). When will I start Physical Therapy after surgery? Physical therapy is usually started within 2-3 days after surgery. Depending upon the nature of the procedure, we may occasionally delay physical therapy for a short period of immobilization. How long will I be at the surgery center the day of surgery? Patients will typically arrive 1-2 hours prior to surgery, and will be in the recovery room for an additional 2 hours after surgery (add in the time of your specific procedure). Most patients are there for approximately 4-6 hours. We will make sure you are comfortable prior to leaving the facility. If the patient is a minor, a parent/guardian needs to remain in the building during the entire process. If the patient is an adult, then they can be dropped off prior to the procedure. Once your recovery is complete, the facility will call the contact provided to come pick you up. Can I eat or drink anything before surgery? This depends on the exact procedure you are having, but most surgeries take 1-2 hours. Please keep in mind that this does not include prep time, anesthesia induction and waking. How often/long should I ice for after surgery? Patients will ice 3-4 times a day for 30 minutes. After the first week to ten days, patients should ice once or twice a day for at least a month or two. Will I be taking any medications before and after surgery? You will be given specific instructions regarding any medications you are already taking. Patients are to stop vitamins, aspirin and anti-inflammatory medications ten days prior to surgery. We advise for over the counter Zantac the night before surgery to help prevent nausea caused by anesthesia. After surgery, you will be prescribed medications to reduce pain and aid in sleep. In most cases, antibiotics are provided through the IV during your procedure and are not required afterwards. Dr. DeSimone’s surgical coordinator will make efforts to define what your responsibility is and to communicate with you in a timely fashion. When is my first appointment following surgery? Your first appointment will be the day after surgery to review your procedure, operative photos, postoperative instructions, and to change your dressings. 7 - 10 days after surgery you will return to the office for suture removal and clinical assessment.